The whole service needs to stick to a strict time slot, this is usually 45 minutes. An additional service can be held before or after for family and friends. If the body is to be viewed before cremation, the body needs to be embalmed. This requires bodily fluids being removed and replaced with a chemical solution that preserves the body for longer. If the body is to be placed straight into a coffin and not be se, then it will be stored into a refrigeration unit. Funeral directors can dress the deceased in any clothes that the family wish along with any items that are approved for cremation. If a direct cremation is chosen then the body will typically be cremated in whatever clothes the person died in. Does the Body Need to be Embalmed Before Cremation? Embalming is not a requirement for the cremation process and is only advisable if there will be a public viewing for friends and relatives to say their final goodbyes. Embalming might also be necessary if the body has to be transported by rail or air, or because of the length of time between the death and cremation process is too long to keep the body in a suitable condition. Is a Coffin Necessary for Cremation? No, a coffin isn’t 100% necessary for a cremation. For cremations, coffins are mainly used to provide a dignified way to move the body. The only requirement for a cremation is that the body is placed in a rigid, combustible and enclosed container. Cardboard coffins have become more popular due to the money saving aspect. What Happens on the Day of the Cremation? On the day of the cremation, the coffin is brought into the chapel followed by the mourners. The coffin is then placed on a raised and decorated platform before a religious or secular service is held. This is followed by the removal of the coffin, after which the mourners leave the chapel. The coffin is then taken into the committal room, where the name plate is matched with the cremation order to ensure the body is correctly identified. The coffin is labelled with the appropriate card which provides all the necessary information for the cremation. The final step is for the coffin to be placed inside the cremation chamber where it will be exposed to temperatures of 800°C-1000°C. How long after the ceremony is the body cremated? The body is usually cremated within a couple of hours,but the crematorium can take upto 24 hours to start the cremation process. Yes, the coffin is cremated along with the body and everything inside. The container the deceased is laid in before it’s placed into the chamber is cremated along with the body. Once the coffin enters the crematorium, it is legally not allowed to be opened. Do you have clothes on when cremated? Can Relatives Witness the Cremation Process? Yes, usually up to two relatives can witness the cremation process if they wish to. What Happens to Jewellery During the Cremation Process? Metal jewellery and the nails which hold the coffin together are non-combustible and therefore will not be broken down during the cremation process. After the body has been reduced to its basic elements, a magnet is used to separate the metal parts which are buried on the crematorium’s grounds. Since the jewellery is non-salvageable and won’t form part of the ashes, it’s advisable to separate it from the deceased before the cremation. If a family has chosen an urn for the ashes, then the funeral director will place the remains inside this urn for the family to collect. What Happens to the Remains After the Cremation? After the cremation, the ashes are removed from the cremation chamber and placed on a cooling tray. Any metal pieces are then removed and the remaining ashes are reduced to fine white-grey ash with the texture of coarse sand – this is bone ash – before being placed into a temporary urn. Do I Have to by an Urn for the Cremation? The container you’ll receive the ashes in will be very basic, so you may decide to purchase one if you wish to display the ashes in your home or a biodegradable urn if you wish to commit the ashes back to the earth. These decisions can be made after the cremation though when you have time to decide. What Will I Get After the Cremation? Unless you’ve already made another agreement, the ashes will be given to you in a basic container. On average, men’s ashes weigh 3.5kg and women’s ashes weigh 2.5kg. How Can I Store the Ashes After the Cremation? There are many different ways of storing ashes. You can place the urn permanently within a columbarium – a room or structure located within a cemetery or chapel where niches are provided to store urns containing ashes. You can keep an urn on display in your home. You can keep the remains within a memorial in the shape of a memorial rock, grave marker or cremation bench with an integrated repository inside a cemetery. 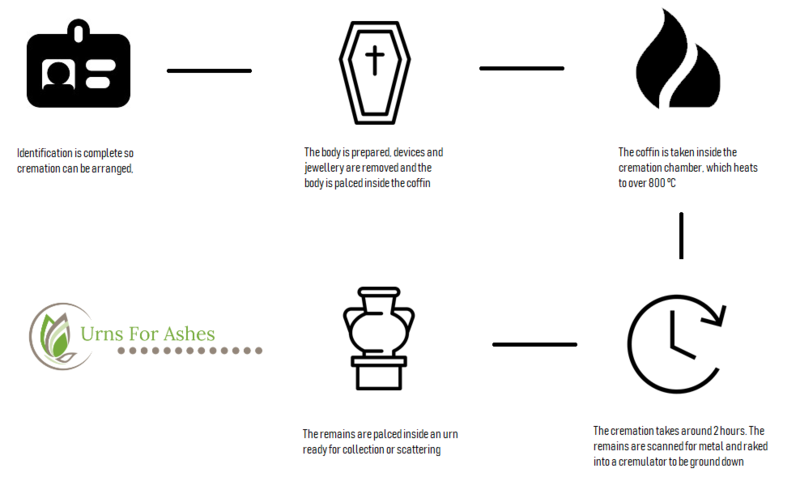 We have a more detailed article that lists your options for the ashes. Can the Ashes be Scattered After the Cremation? Yes, ashes can be scattered on land, at sea or in air following the cremation. As long as you have the owner’s permission, you can scatter remains on any piece of private land. If you want to scatter the ashes on public land, such as in a park or a favourite location of the deceased, you’ll need to seek permission from the local government before doing so. Please read our scattering ashes guide for more information. What Are my Other Options After Taking Home the Ashes? Remains can be converted into glass by combining a small part of the ashes with molten glass. Similarly, ashes or hair can also be used to create memorial diamonds which are developed within a laboratory. Another option is to keep a small portion of the ashes as they are, but store them within a locket which forms a piece of cremation jewellery. What Happens if I Don’t Want to Take the Ashes After the Cremation? If you don’t take the ashes and decide to leave them at the crematorium, the ashes will be scattered over the gardens of remembrance – a special area set aside for the disposal of cremation ashes. Although some crematoriums offer to mark spots with rose bushes or plaques, some do not. So make sure you discuss this first before you make your decision. You will have 6 weeks after the cremation to collect the remains before they are scattered. How long does it take to get the ashes back after cremation? Ashes are usually passed on to the funeral director after the cremation for collection. If you have not employed the services of a funeral director, you’ll usually have up to 6 weeks to collect the ashes before being charged. If you have left the crematorium no instructions of what to do with the ashes, they will be scattered within the gardens of remembrance. Before they’re scattered, the person on the documentation will receive written notice 14 days. Who Can Collect the Ashes After a Cremation? Only the funeral director or a named individual, who will be required to bring identification, can collect the ashes after the cremation. Do Teeth burn during cremation? Do All Funeral Homes and Cemeteries have a Crematorium? No, only a small number of cremation service providers have their own crematoriums. Is a Cremation a Religious Process? Cremation is neither a religious nor a non-religious process – some religions encourage it and others disapprove of it. You can choose to have a religious service as part of the cremation process, but if you’re not religious, you can opt for a secular service or no service at all – this is called a direct cremation. Are Cremations Done Individually in the UK? Yes, cremation chambers are generally only large enough to cater for one coffin and law states that bodies can only be cremated one at a time. Is the Cremation Process Just for Humans? Humans and animals alike can be cremated in the same manner. For more information please see our Pet Cremation guide. Typically no. Due to the increasing cost of land, burials tend to be more expensive. To find out more, read our guide to the cost of cremation. We have heard this a few times and the answer is no. Unless a pacemaker has made its way into the cremation chamber, then body will not explode unde the heat. Does the body sit up during cremation? Yes, this can happen. Due to the heat and the muscle tissue, the body can move as the body is broken down, although this does happen inside the coffin, so it won’t be visible. No. As you can see from the video above, names are checked at every stage of the process and only 1 bdy at a time enters the chamber.